This post was originally published in October 2013. When you’ve been blogging as long as I have and have over 850 posts (!!) published, there are bound to be some recipes that get lost in the archives. This is one of those recipes that I wanted to bring forth into the light. I could just update the pictures, but it’s still buried in the recipe index. If I make a whole new post, I then have two posts with the same recipe, and that’s kind of weird. Instead I decided to republish it and let it have a moment on my homepage. 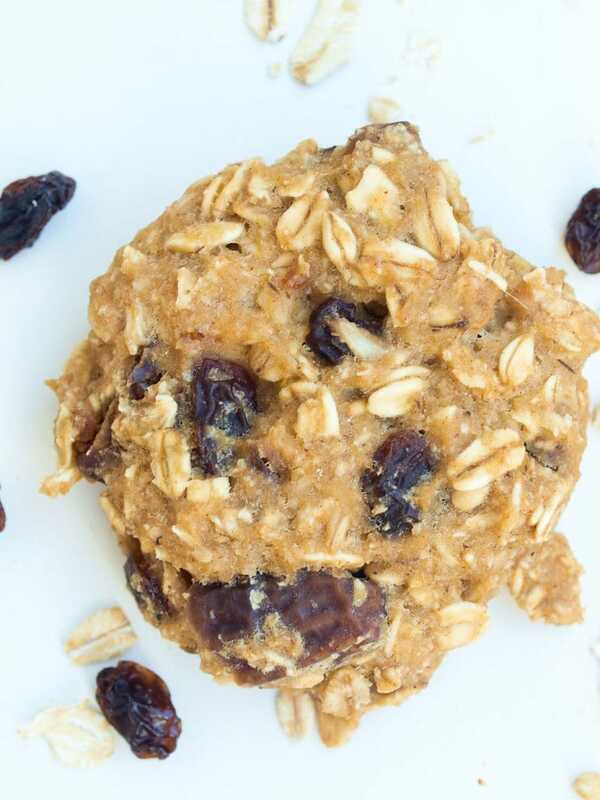 🙂 I changed the original name because Applesauce Breakfast Cookies is just better than “Healthy Apple Spiced Breakfast or Snack Cookies.” Umm..what was I thinking with that title?! I also made a minor change to the original recipe. 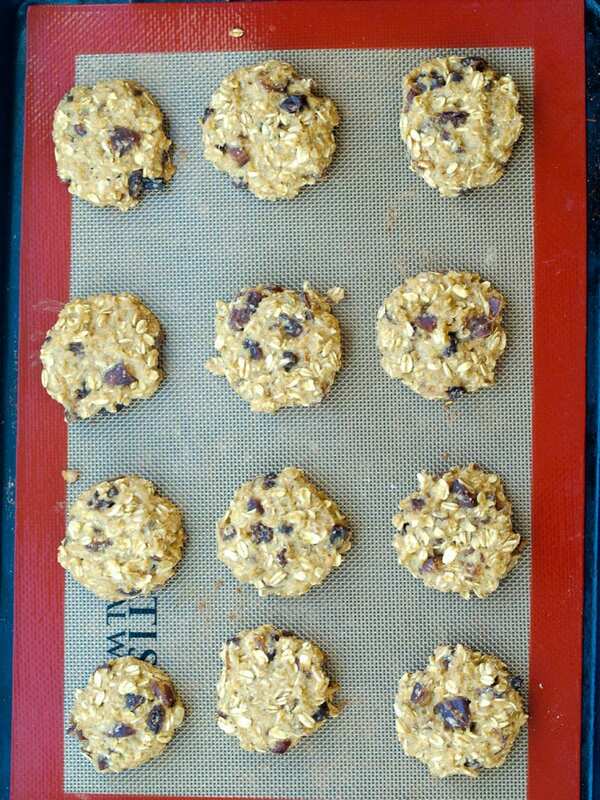 A reader commented that she may try adding oat flour along with the rolled oats, and so I gave that a try one day and realized it gave the cookies more structure and helped them stay together a little better. I have also made these bigger through the years, so I note in the recipe that you can make them small or medium depending on your preference. The smaller size is great if you have a toddler around, the bigger size is great for adults and big kids. The rest of the post is going to be my 2013 self–enjoy these new-to-most-of-you Applesauce Breakfast Cookies! The other day, I wanted to make my pumpkin breakfast cookies. I had already told Meghan we were having cookies for breakfast. I went into the pantry and…no pumpkin. Who doesn’t have pumpkin stocked in their pantry in October?! I guess I’ve made one too many pumpkin concoctions this fall. Now you don’t tell a five-year-old little girl you’re having cookies for breakfast and then not give her cookies for breakfast. I knew I was going to be making cookies of some sort. The bad news is I was out of pumpkin. The good news is a new recipe was born. Necessity breeds invention, right? Something like that. I called these breakfast or snack cookies because we had them for breakfast and Meghan brought some in her lunch box the following day, too. 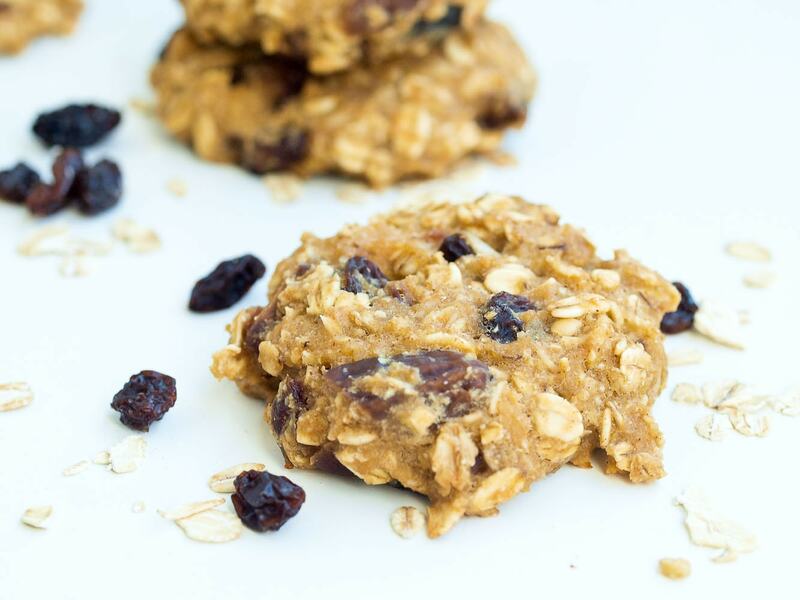 These healthy cookies are vegan, gluten-free (if you use certified GF oats), refined sugar-free, and nut-free. They are a perfect little nutritious treat for a school lunch! 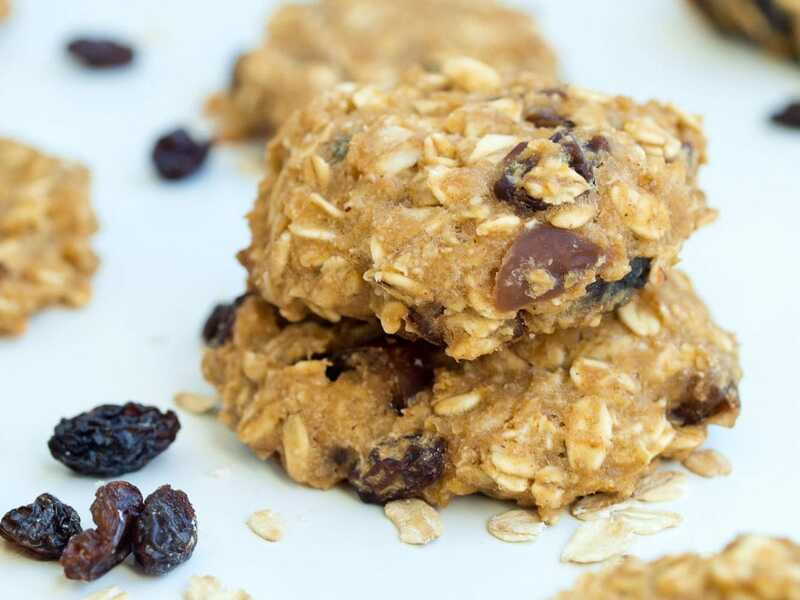 These healthy cookies could not be easier. One bowl is all you need. Mix up the ingredients, pop them in the oven, and you’re done! 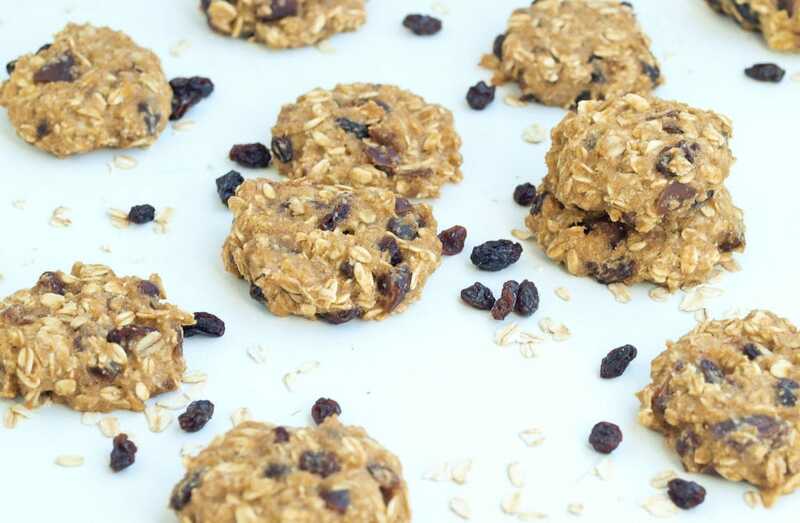 This healthy cookie recipe is vegan and gluten free and is perfect for breakfast or a snack. You can also satisfy your sweet tooth without any added sugar! Lightly oil a baking sheet or line with parchment paper or a nonstick baking mat. Form into small or medium balls (small balls will yield 2 dozen cookies, medium balls will yield 1 dozen), flatten, and place on the cookie sheet. Bake in the preheated oven about 12-15 minutes, until they are just starting to get golden brown. Enjoy! I loved reading your comments and suggestions on what natural products you are loving these days. If you haven’t chimed in yet, please do! I hope everyone has a great weekend! My kids would love cookies for breakfast! 🙂 these sound great…both the apple & pumpkin! Found your blog through your comment on eat,live,run…love it! There’s nothing worse than a pantry without pumpkin…but glad such a delish recipe resulted from that tragedy! Just made these for breakfast for my 18-month-old and doubled the batch to freeze for snacks! 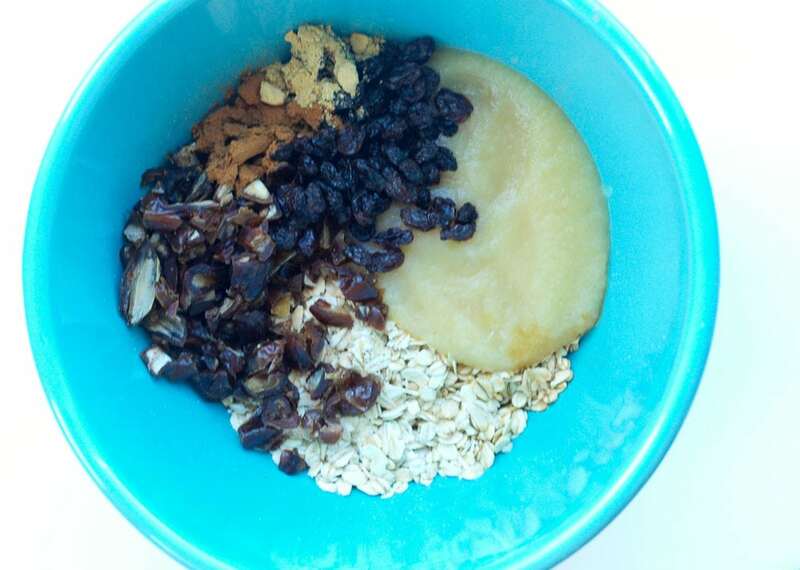 Love the sweet flavor with applesauce, raisins, and dates. When I make them again I might grind a small portion of the oats into flour to make them hold together a little better. Thanks for letting me know, Ashley! These were good! I added 1 Tbsp. honey and a small pinch of sea salt. Other than that- followed it exactly. Thanks for a great new breakfast idea on the run! These cookies look great! Would definitely try them on my 15 month old. Just wondering if thses have a soft chewy texture or more on a crispy side? Yummy and healthy! Just made a batch to freeze as snacks for my 11mo and she loves them..and so does our dog walking behind her cleaning up the crumbs! So glad to hear that Cody! Thanks. FYI, if you are making these with raisins, you probably shouldn’t let your dog anywhere near them. Raisins are one of the most dangerous foods for dogs! What to do if I don’t have dates? Any good substitutions? Any other dried fruit will work! Can I substitute oats flour with wholemeal flour? I’m thinking of substituting unsweetened dark chocolate chips for the dried fruits my kids aren’t big fans of raisins and such. Also maybe adding a bit of agave. Dark chocolate chips would be amazing here! Very apple-y and yum!!! Perfect fuel for our family hike today! Thank you!!! Do you have a recommended serving size & nutrition information? My son loved these, and I loved that they don’t have on so that he can take them to school! He loves ob but everywhere is allergy free now. I like the pumpkin idea! I have been looking for recipes for me grandson (4 years old) because he is allergic to eggs, nuts, and milk making it hard to find something he can eat, and not to mention that he is a very picky eater. Sugar seems to be his go to in food and I want to give him something he will eat and has some redeeming qualities. I see that flax seed is a substitute for eggs but I’m not sure he can have that either. I have a plant based protein powder that I have made smoothies for me and thought I could put that in something. This is new to me and would appreciate any suggestions. Are the dates required or would it be ok the omit them? I have everything but dates and am looking for yummy treats to aid in weaning. The dates add some sweetness. Do you have the raisins? You could add more raisins if you omit the dates to make up for the loss of sweetness. If having them less sweet doesn’t bother you, it should work fine to just leave the dates out. I have so much applesauce that I was looking online for a recipe to use some of it as well as my sister-in-law is displaying her Driftwood Art in Burlington, Ontario, Canada for the first time so she is busy getting more pieces done so I thought it would be nice to give her something to pass out at the bazaar / show. 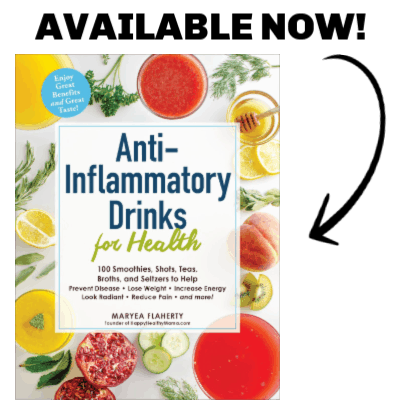 Thanks for being there with a naturally healthy recipe. If you want I will post the results. Are the dates left in bigger chunks? Or could you blend them and add it in like a paste? I substituted 3/4 cup mashed banana for the dates and it gave the cookies the sweetness it needs. Thanks! Glad to hear that worked for you! Thank you! Can you use rice flour? I’ve not tried these with rice flour, but I feel like it should work! Please explain: 2 dozen cookies, at the beginning of the ingredient list. Do you have nutrition information for these cookies? I’m on Weight Watchers and these seem like they would be a great starter for sustaining me through lunch and/or just a sweet snack. Just have to make sure it works for the “smart points”. I just figured out the nutritional information and added it to the post. If you make these into 1 dozen cookies, they will each be: 106 calories, 1.8 grams fat, 20 grams carbohydrates, 10 grams sugars, and 2 grams protein. I hope that helps! I didn’t have dates so I used dried apricots and they worked great. I also added the flax in addition to the egg because it helps bind the dough and I like the flavor. I like how easy and flexible this recipe is – you can whip these up in just a few minutes. I detest raisins so I had to drizzle the first batch with some melted dark chocolate to add a little sweetness. Since there is no added sugar, you definitely need raisins, dried cranberries, etc. to bring up the flavor, but the best part about this is you can control what and how much you use. Thanks for the recipe, I will be adding this to my list of go-to’s for healthy snack! The oil is mixed in the ingredients. 🙂 I hope you love these! LOVED THESE! Have made them as you posted them….and then I started expermenting. I had mincemeat in a jar, dumped that in with the dates and applesauce . Heavenly yummy. Then we did dried cherries with mincemeat and applesauce. Thats really good too. Tried variety of combos. Once I was out of applesauce so used apple butter. Those were pretty good as well.. we like cookies so I have a homegrown panel of tasters. So far everything I have done to the base recipe has been a hit. Thank you for giving me such yummie ideas! Would love to see more protein especially if you are eating them for breakfast. Any ideas of what to add and keep the same good flavors? Even adding the add doesn’t boost the protein enough in the amount you would eat. Good receipe that I bet you can make great with your creativity! Thanks so much. As a fitness professional, I am always looking for healthy alternatives to pass along. I love these cookies and intend to consume them as lactation cookies once baby no.2 arrives in a couple weeks. If these cookies are baked, do you know if they can be frozen and for how long? I doubt I will have time to prepare and bake them with a newborn and toddler. Yes, these can be frozen! They will last in a freezer for 2-3 months. Can I leave out the flax seeds? And just use raisins not dates? I’m not sure if it would hold together as well without the flaxseed because that is acting as an egg. If you can do eggs, just use an egg in place of the flaxseed. You can definitely try to leave it out, the cookies may just fall apart more. And yes, you can use all raisins instead of a combination of raisins and dates. I hope you enjoy these! Hi, quick question, I am about to make these and I wanted to know which kind of dates do you mean? The large Medjoul Dates or the smaller dates (our are from Tunisia)? I am hoping the smaller dates :). Will post a reply once these have been baked! Thank you! Took around 30 small dates to get 3/4, as they got mashed up together as I was trying to chop them. Seemed like a lot and the cookies turned out quite sweet, but they tasted so good! We don’t have unsweetened apple sauce over here so I baked my apples and blended them (which was what I used to do for baby food too :)) I will try this recipe again when my munchkin isn’t getting her molars in lol! Anyone reading the comments, try this recipe, so tasty! You know how you should ALWAYS use the exact ingredients the first time you make – anything??? I usually stick to that rule. Except for this time: I was SO jonesin’ for apple-oatmeal cookies that I just jumped right in. Had 5 dates; chopped them and added more raisins. Oops! Almost out of applesauce, mashed up a banana; no oatmeal flour, but I have lots of almond flour. In spite of all of these changes and subs, the only problem I had was the consistency of the final cookie and, please: I understand that it’s all my own fault!!! And that DO taste great! I’m gonna try again, as soon as I demolish this batch. Thanks for an easy to put together recipe. How can you best store these and how long for? Hoping to have them over a few days but not sure if that’s possible or if it’s better to just freeze them straight away. Yes, these can be stored in the refrigerator for about 3-4 days. I hope that helps!